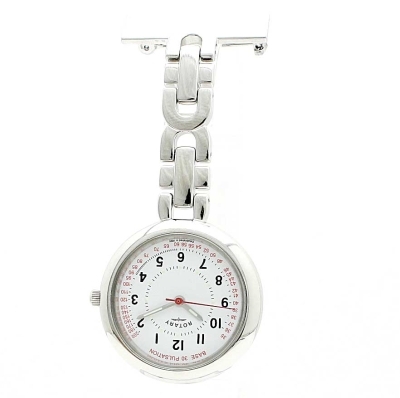 An attractive and well made quality nurses fob watch from Rotary. Stylish fob watch. Simple online order form and product arrived very quickly. The only thing I would advise other to be aware of is that it only comes in a cardboard box. I bought this fob as a gift and had looked at many sites to find one I liked. Other sites had images of the watch in a lovely Rotary box and I wrongly assumed it was a standard with the watch. To be fair the watch shop was selling it cheaper so maybe that is why. Our daughter loves to ski and we gathered that she would like a fob watch as when she is on the slopes it is very difficult to get her phone out to check the time. No one makes a sports fob watch and most fob watches available are poor quality. A this is part of her birthday present we were delighted to find this excellent example in the Rotary range from Watchshop. Great product, wonderful efficient service - thank you. The item purchased was a nurses fob watch, which on arrival proved to be a beautiful quality product, very well packaged and in perfect condition, and delivered very promptly. I was pleasantly surprised. This was destined to be a Christmas gift for my wife. Lo and behold it arrived as indicated on the web page. Packaging was excellent, with watch being well protected in transit. My wife is happy with the pin on the bar and the size of the dial. I would have no hesitation in recommending watchshop to anyone else wishing to purchase a rotary fob watch. This watch was absolutly perfect for my sisters graduation present looks exactly whats advertised. Delivery was fast too. Great value for money product, very user friendly website, quick and easy purchase process and extremely efficient delivery. the rotary nurses watch is well made and looks and feels like it is i.e. classy watch. Really liked this watch, I wanted one for a gift and so many of them dont cost a lot but also look cheap.This looks exactly how it is on the web site and is really pretty. It was really easy to order and turned up on the expected delivery, the whole process was simple and easy to do. The watch was a Christmas present for my wife and she loves it, not to big and not to small and very clear to read. Having a nice clear white face and easy to clean stainless street case and fob. This item was bought as a 40th birthday gift - I couldnt believe how quick the whole turn around of delivery was order on a Tuesday afternoon to delivey Wednesday morning. All in all very pleased with the item and was also able to get it engraved for extra speacialty. Lovely keepsake gift and can also be worn within her job. Very nice watch, very easy to use as all Rotarys traditionally are. The other half loves it for her job, its easy to read the time and although it could be better with a stopwatch type setting, for the size and immediate requirement, fits her needs. A fantastic service which I highly recommend. I did purchase two watches on the day and I am very pleased with the service on both. I chose this online as a gift for my nieces 21st - and also to celebrate passing her Uni degree in nursing. So not lightly. The photo did not do it justice! Its chromed,delicate and feminine and the outer band of graduations on the dial are extremely appropriate for functional use at work. Its also decorative enough to be pleasant on the eye - and not cause Matron concern that its too flamboyant either. The suspender links are perhaps a bit too chunky - but there again they are stout and functional and fitting for many years of service. Which is as well, as the watch comes with the reassuring Rotary Lifetime Guarantee. Exactly as it appears on the website. Very nice size in a lovely presentation box. Watch face is upside down for easy reading. Only problem is that there is no room for engraving. Bought as a graduation present very pleased with the presentation box. The watch is stylish practical and just that little bit different from the many others I'd viewed. It has all the features needed for a busy nurse.My daughter was delighted with it. Very well made sturdy nurses watch, with a life time warrenty, very sturdy nice looking presentation box. Only downside, we coudnt get it engraved as the company have the whole back plate covered in their own details. very pleased with the watch.!!! The watches features are very practical. It came in a lovely box which was nice as it was a gift. This watch was just as pictured. As a special gift for someone starting their nursing career, it had to be practical and functional, but I wanted it to look nice too. It is a lovely decorative piece which is well designed with the additional features such as the extra hands for counting pulse rates etc. It has a smooth finish so can easily be cleaned - so no indents or similar in which germs could get trapped - another really important thing when it is being used by a working nurse. the watch is top quality with easy read dial and precise timings. It has a classic timeless look which fits with any usage.